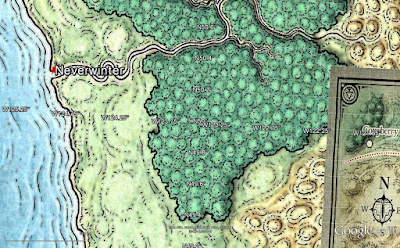 In Part I, I discussed the process of getting this awesome and massively detailed map of Northern Faerun by Mike Schley, onto Google Earth. 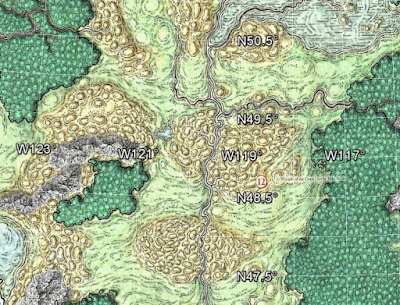 Going a little further than in previous posts, I wanted to see if I could display different maps at different zooms. For this I needed to create a KML file. This is actually easy to do manually, just create an xml file with a KML extension. You can get a lot of information on what is possible from KML files on Google Maps. Also, KML files use decimal degrees so I had to use the translated coordinates from previous posts. I created two KML files. You can probably do it in one, but I had some issues with properly nesting the xml, so I separated them. The first file just positions the same four maps (though I'm using versions I created without text overlays) I used in my other posts. Getting the "href" path in the xml right on a Windows machine took a while to sort out, but otherwise this was fairly straightforward. 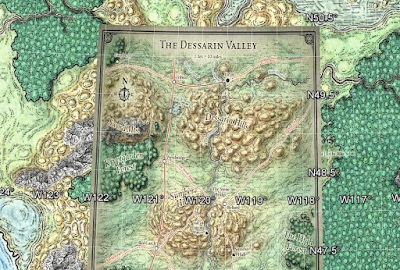 I also added a placemark for Neverwinter, just to experiment with adding individual elements on the page. You can of course swap out the icons, position the text more elegantly but this was enough for a test. Here is the first KML file. 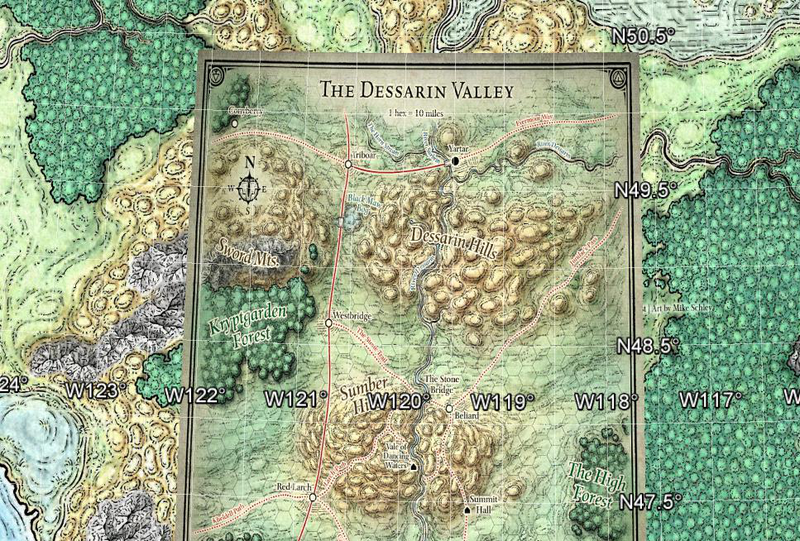 And here is the Dessarin Valley KML file. Getting this into Google Earth is now just a matter of File | Open and select each KML file. KML files can be used in other mapping software as well. In Part I I overlay a map of Faerun on Google Earth. In Part II, Stitching it Together I repeat this process with the 34 part PDF map. Part III, Higher Resolution and now moving it around. In Part IV, KML Files I use KML files to display maps at different zoom levels.